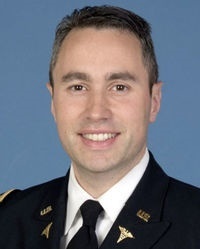 LTC Capaldi completed dual residency training in Internal Medicine and Psychiatry and fellowship in Sleep Medicine at Walter Reed National Military Medical Center. LTC Capaldi holds board certifications from the American Board of Psychiatry and Neurology and the American Board of Internal Medicine to practice General Psychiatry, Internal Medicine, and Sleep Medicine. In 2013, LTC Capaldi was elected as a Fellow of the American Psychiatric Association and the American College of Physicians and currently serves at the president of the Society of Uniformed Services Psychiatrists. In January, 2013, LTC Capaldi was appointed as officer in charge (OIC) of the Restoration Program at Bagram Air Field, Afghanistan. As OIC, LTC Capaldi was responsible for the comprehensive behavioral health restoration program, all clinical operations, and prevention activities for over 45,000 NATO troops stationed across Afghanistan. LTC Capaldi has published over 30 peer reviewed scientific articles and book chapters on various topics such as sleep disorders, traumatic brain injury, and post stroke depression that have appeared in several medical journals. He serves as the Psychiatry & Clinical Psychology Disorders Capabilities Manager and Steering Committee Chair for Physiological Health and Performance in the Military Operational Research Program, MRMC.